Welcome to Becoming Me. My Blogger ID is MrsNaz, but many already know me as Angela. If you are participating in the UBP hosted by 5 Minutes 4 Mom, I thank you for stopping by and hope that you will make yourselves at home. If you are a regular visitor here, welcome back. I have enjoyed sharing my heart with you over the past year. Your prayers, comments, and encouragement make me thankful that I began communicating my personal journey with Christ in such a public forum. I now consider so many of you true friends. There are many types of parties. 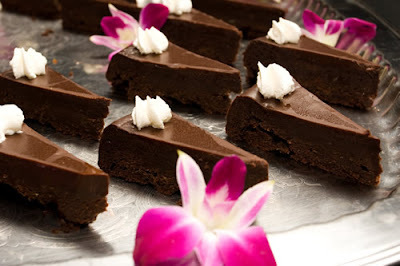 I'm a soirée kind of girl, so if this were a real life event, I'd invite you into my home to share some decadent chocolate desserts, a glass of red wine or sparkling cider, and good conversation...probably a little icebreaker as well, because I love cultivating friendships and community. Since this is not a live party, I'll just show you a picture or two of my favorite dessert bites. This way we can drool together...in the name of community. The icebreaker portion of a gathering is when attendees can better get to know one another. So, in that spirit, here is a little introduction to Becoming Me and why I blog. Each person accumulates stories from life experiences. Some stories tell of blistering, bitter, frightening seasons when emotional fires, droughts, or floods brought devastation to a heart. Other stories derive from adrenaline enhancing joy and blissful happiness from seasons decorated with wonderment and adventure. And then there are stories that may not carry emotion but still garner enough weight to impact life. The creator of the universe is both the author of and lead character in my life story. With every experience I learn more about who I am in Christ...more about becoming me...the mature me God designed to be completed in Heaven. You can read more about me and my family here. Or, you can visit my other blog here. The nutshell version is this: I'm a wife of a college professor and the mother of two preschoolers. Pumpkindoodle is my 5 year-old daughter and Pickle (who may be given a new moniker soon) is my 2 year-old son. I'm flawed and forgiven. Northern bred and raised, but currently live in the South. I'm quirky, talkative, and attentive; and whenever I take spiritual gift tests, I score highest on mercy and encouragement. I'm also a recovering perfectionist, and a lover of books, sunshine, waterfalls, coffee and cupcakes. Some of the stories I share here on Becoming Me are about my experiences as a mother...the beauty and the heartache. Last year, I wrote very candidly about my experiences with Postpartum Mood Disorder, which is often referred to as Postpartum Depressions (PPD). But not all of my posts are related to motherhood, like this one. I have written about being a wife, being insecure, and being misunderstood. My goal is to write with a healthy dose of transparency, as I believe it key to spiritual growth. The time I spend writing posts for Becoming Me is also a time when I fellowship with God. The stories that matter most to me are the ones I write while praying and researching scripture. Because, even though this blog has me in the title...it's really about Him. So, now, it is your turn to share. Please tell me something about yourself and blog in the comment section.And those of you "regulars" tell me why you keep reading..I could use a pick-me-up after this last week. Also, please do come again. If you, like me, love celebrating the resurrection of our King each Easter Sunday, please consider participating in the Because of the Cross blog tour starting April 5. #1 - Artisan Kitchen Aid Stand Mixer offered by Moms Who Think. I am a mom, and I think this prize would make me very, very happy. #2 - A $100 gift card from Pedal Cars and Retro--Little Pickle turns 2 next month---what a delight this would be. This prize is offered by 5 Minutes 4 Mom and it is a choice of a $100 gift card from either the store above or A Rocking Horse to Love. #3 - Any of the $50 gift Cards to Target--and I already know what I want to buy there. Swim suits for the kids. They have these great ones that include swim shirts! As far as I could tel, there are three generous sites offering these gift cards and they are: Shoot Me Now , Agoosa, and Beginner Baby Blog. If I do not win my top four choices, I'd be thrilled to pieces with any of the following numbers: 5, 8, 16, 48, 49, 50, 53, 56, 60,81, 82, 77, 79, 65, 68, 69, 75, 87, 89, 91, 93, 111, 112, 113, 114, 118, 121, 123, 125. To view the entire prize list, click here. You do not need to be a blogger to be eligible to win!! I am Mel and I blog about politics and I read your blog because you blog with transparancy!!! I see your heart and it is uplifting to me. I am most DEFINITELY drooling along with you over those desserts! Wow! It's that time again? I did the UBP last year. Why do I keep coming back? Because you always know just what to say. What a wonderful post, Angela. You are always an inspiration. So glad taht you posted this. I got to know you so much better. I blog pretty much tidbits about my family...It is mostly for my inlaws out of state. I love the way you write. Enjoyable reading and the fact that you love my Savior too. Hey Angela! I keep coming back because of your honesty and your desire to encourage other women with your writing. I keep coming back to your blog, because you are a sweet blessing. Your post always show such love and faith in God my friend. This is my first visit to your blog - Holley from Heart to Heart with Holley recommended you. I love Mothers of Preschoolers (of which you are one) -- what a wonderful time in your life. I have enjoyed being a MOPS Mentor for over 7 years and consider it one of my highest callings. Thank you for sharing your faith. Those desserts look soooo yummy!! I've been reading your blog since I stumbled upon your series on PPD. And I keep coming back like many others because of your transparency. I've read your blog for almost a year now. I found you through a friend. I love your blog and have actually suggested to a friend for encouragement. You have such a love for the Lord and a desire to grow in Him. You are honest,in today's world of "plastic" people it's so refreshing to know there is someone who is human and struggles everyday with the same kind of things. Keep it up! okay so I just realized that it looks like I'm telling you to keep up with the struggles, I meant keep being you! Well there's not much you don't know about me since my blog is an open book. I keep coming back because I love your heart!! You are honest and transparent AND an encourager. I am drooling over those chocolate strawberries! I keep coming back to your blog because it is inspirational. Hi! I just found your blog from the blogging party. Wow! Just amazing! Your blog is beautiful and unique. You are doing a wonderful job of sharing your testimony. What a blessing! I left a little surprise for you on my blog! Have a wonderful day! I share your love of coffee and also have a little girl. I have found blog writing challenges me creatively. I enjoy writing but don't think it is one of my strengths. Having a blog is good exercise! I'm glad I found you, you have a great way of bringing forth spiritual truths. Those desserts look so yummy!!! I would love to have a few of those with a nice cup of joe and good convo. I am also participating in UBP 2009! I am not a new reader of yours but love to visit you everyday. I hope you have a chance to swing by my blog and party with me as well. Why do I keep coming back? Because I love you, Angela, and I am always blessed by what you write. Yeah, and that picture of the chocolate cake? Has me drooling. I can almost taste it!!! I so want those cakes. Nice to find your blog through Ultimate Blog Party. I keep coming back because reading your blog pushes me to be more honest about my struggles in the journey to becoming. I just love how you share your heart and I appreciate you candid stories. Well, as one of your "regulars" I have to say I love your blog, because of your honesty and openess. I also enjoy reading what you are learning about our Lord and how you are drawing closer to him. Keep up inspiring us all! Hey, I'm a recovering perfectionist too! It's hard work. I'm glad I found your blog and now I'll be blessed by your transparency! I am Dorinda - or treasureseeker. I can't even remember how I found your blog- but your refreshing transparency and your anointed talent with words keeps me coming back. You've gone and made me hungry! Now I'm going to have to go cook supper. I wish I had something that yummy to chase it with. So I'll have to come back and browse through your posts later, but I will be back! Hands down best cheesecake recipe ever is Chocolate Vanilla Swirl at TammysRecipes.com! those strawberries look great! yummers! boy your kids have grown! and yes! we met last year! :) hard to believe it's been a year already isn't it? I may have to partake in your Easter post! that looks like a great idea! CHOCOLATE!!!!!! Hope you can come visit me! I've always loved your heart for others - you are SUCH an encourager. I see authenticity in your writing. And I see very well written works that make me want to be like Him. Thank you Angela! This party is a lot of fun, and I haven't even really joined in yet on my own blog. I may just have to though. Hope you'll pop by sometime. Yeah, um...Now I NEED some chocolate covered strawberries. Maybe one day I'll get to see you and have some! Hey, thanks for stopping by my blog. Suddenly I am having a craving for chocolate and strawberries, none of which are accessible to me at the moment. Your kids are cute, and they look so much alike! About to read some of your other posts, have a great day! We have a little friend nicknamed Pickle too. :) I'm a homeschooling mom who started blogging because we all have a tale to be told. My blogs are about our homeschool journey, which entails all aspects of life. Ooh, those desserts look wonderful! :) I'm looking forward to reading through your blog! Angela - You are the one who has really introduced me to the blogging world. I always enjoy visiting your site and reading your touching stories. Who knows, your inspiration may make me begin my own blog one day! 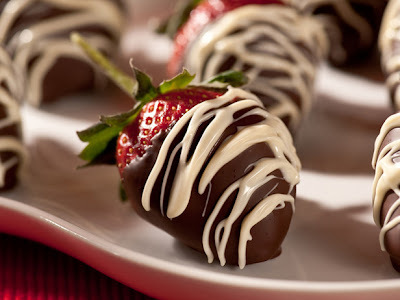 By the way, the chocolate covered strawberries look delicious! Party on! I'm Joules and I originally began blogging because I am a Christ follower and I like to write. I am a huge fan of southern agrarian writer, Flannery O'Connor, who had a unique niche in American Literature, writing about "glimpses of grace among the grotesque". As a Christ follower, I follow in Christ's footsteps. As a writer, I have been trailing Flannery, who also followed Him. I want to look at the world like she did, looking for God and where He shows up in my world. This is basically what my blog is, a record of my own glimpses of grace. Six months ago, my life took a truly grotesque twist as I was diagnosed with breast cancer, had a double mastectomy, then began a chemo journey I am still on. So many things in my life changed. My blog morphed into the logical place to keep our families updated, since we are all live long distance. What didn't change was my absolute need to see God in the midst of this cancer/chemo chapter. And to keep it in perspective as such. Cancer is not my life, but chemo is a real and present antagonist that I have to deal with in my story. This is where my blog has gone at this point. When I read your blog, Angela, I connect with a kindred soul of a Christ follower who is a writer. I find your blog to be a reflection of your beautiful, delightful, vulnerable soul. Here for the party - CUTE blog!!!! - you and me - let's do some baking together some time! Thank you for stopping by. Nice to meet you. I love your theme and how you express yourself. Have fun at the parties. Those desserts look quite yummy. Remind me to go to the gym in a little bit to work off all of the calories. Thank you so much for your blog..."becoming me" is what I want to be, with God's help! Oh man, those pics are D-E-L-I-C-I-O-U-S! Thanks for stopping by and enjoy the party! Thanks for visiting my blog. I enjoyed visiting yours and will be back to visit again soon. Thanks so much for stopping by my blog. I have enjoyed my visit to yours. I have been a BLOG READER for several years, but only in the last couple of months have began to blog. I love it and all my new friends. Come by again soon. Great party! Hope all is well! Love the chocolate strawberries, my fav!!! Those snacks look so yummy!!! You have a great blog, I look forward to visiting again! Welcome to the party! Thanks for stopping by my party! You have beautiful children as well! And I would have to stay for the sparkling cider - ummmmmmmm! Hi Angela! So nice to meet you. I am an old hippie grandma in Colorado who is trying to restore an 1880 Victorian Stone farmhouse. I am participating too! Party on! It's nice to meet you! I'm here from the UBP and look forward to getting to know you more this week. What a great introduction! It is so nice to "meet" you! Your blog is very refreshing and I enjoyed my visit. i love the strawberry dessert..yummy! Hi, there. Stopping over while blog hopping. I'm enjoying the UBP party. It's in the wee hours of the morning but I have a migraine so can't sleep. It's nice to meet you and your blog. My blog list keeps growing. Blogs are my favorite "me" time. I have a toddler learing blog at www.superfunmama.blogspot.com. So nice to meet you! I love your blog, glad I have another great one to read! Hello there. Knocking on your door from the blog party. Hope you don’t mind. Hello! Poppin’ in from The Ultimate Blog Party…all the way from Queensland, Australia! G’Day! I hope you have time to visit my party soon. I want to invite you to the Mommie Daze Virtual Baby Shower that I am hosting May 15 to June 8. This is an international even and there are prizes! Stop by my blog for all the details. Those desserts are making my mouth water for serious. It's nice to meet you! I'm quite intrigued and am learning how to get around! Just stopping by from 5minutes for moms blog party! Thanks for writing with such candor. I appreciate your humble heart. I'd love you to visit my site too! If you would like to share a post from this site, you have my permission to copy and paste the first paragraph onto your blog or website with a link to the original article. Please list my name as the author. Thank you. Are you still here? I'm not. I've moved to www.AngelaNazworth.com please come over to see me.